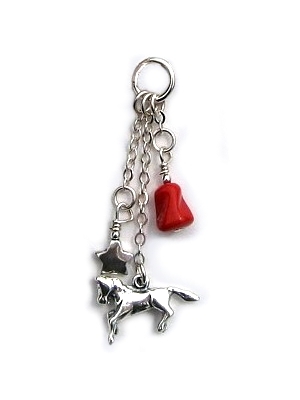 Enchanting cluster pendant, complete with Sterling Silver Horse, Star and semi-precious Bamboo Coral. Designed to heal and inspire. In Navajo legend, the Horse is like the wind. Its medecine is speed, endurance, power and freedom. When Horse agreed to carry man on its back, it transformed the Native American nations from slow-moving nomads into powerful mounted warriors. Horse also teaches us the responsibility that goes with power and freedom. Wear on its own on a chain. Or clip onto an Affirmation ring for even greater impact. For a chunkier look add more Spirit Charms.